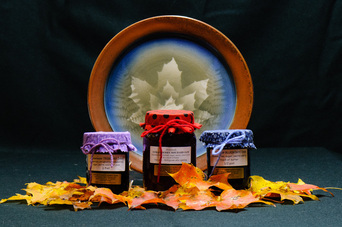 A delicious spreadable maple product made from pure maple syrup that has been boiled, cooled and whipped. Excellent on toast, bagels, english muffins or any warm food. We pick the berries each year on a lovely hilltop farm owned by some great friends! Obviously, made from strawberries and rhubarb. With the rhubarb, this makes a less sweet jam. Jam made with blueberries, strawberries and raspberries. Superb for pbjs (peanut butter and jam sandwiches) Yum!